Contains keratin amino acids – the stuff your hair is actually made of - to fortify damaged hair, making it feel stronger, shinier and less vulnerable to damage. Free from animal fats like tallow which can weigh hair down. Did we mention how soft and silky this will make your hair feel? Light formulation is even suitable for leaving in your hair for extra soft and lovely locks. Water, myristyl alcohol, dicetyldimonium chloride, hydroxyethylcellulose, cetyl alcohol, cetearyl glucoside, cetrimonium chloride, stearalkonium chloride, panthenol, keratin amino acids, phenoxyethanol, fragrance. “Sure, others claim to be safe, but have they been doing it for 25 years? We have. Your search for the perfect daily hair conditioner is over. 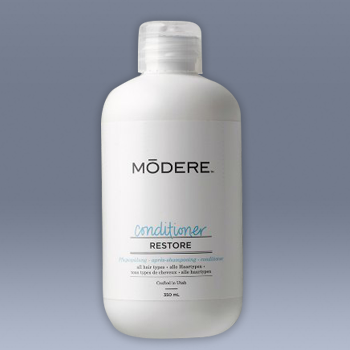 Conditioner for All Hair Types is a lightweight, moisturising formula with keratin amino acids and panthenol that leaves hair soft and silky without weighing it down. It's effective without being heavy, and light enough to rinse out or leave in for added conditioning."